In much the same way we look for opportunities in attack – say a slow or poor tackling player to expose – we must focus on spotting opportunities in defence. We certainly demand players stay aware of threats such as overlaps, powerful ball carriers, steppers, great playmakers, accurate tactical kickers, etc. Communicating and addressing such threats are vital to preventing tries. 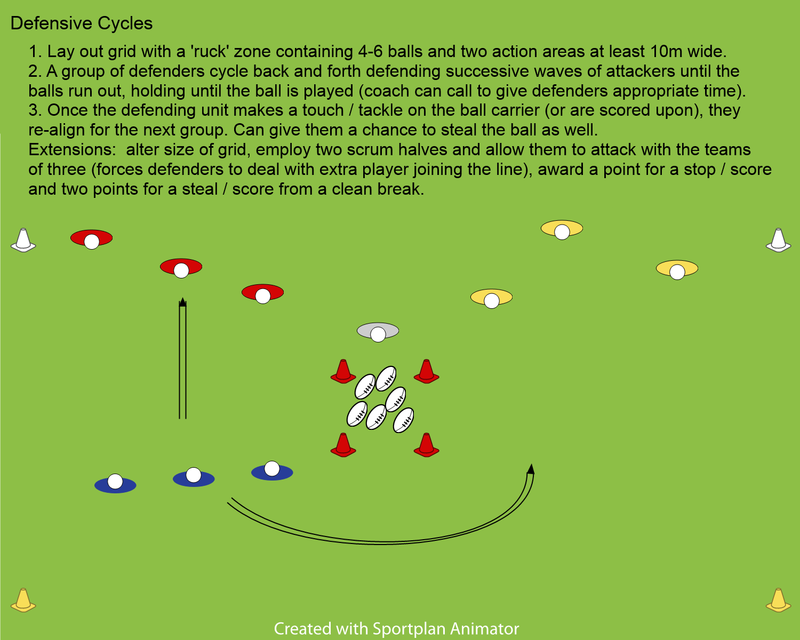 I like to add a positive spin on playing defence, one that is not so reactive, but creating situations where we can be proactive. To do this effectively, we must make players aware of these situations and visual cues that can allow them to force mistakes or win possession. In my playing days, we used to pile several players into every ruck when playing defence. I still have a vivid memory of popping my head out of a ruck against a touring Welsh side to see three or four of our defenders standing against nine attackers from their side. It was then that I realised we were too often wasting our efforts in rucks that were lost, not only preventing us from dealing with threats on the next phase, but certainly preventing us from actively getting the ball back. Throughout the 2000s, we saw more and more top sides reduce the number of players they’d commit to rucks on defence. It’s common now to see a team commit just one person to make a nuisance of him/herself, if any at all, when the ball is available to the attacking side. This typically means there are more defenders standing than there are attackers (with two or three going in to win the ball). It is from these situations that we must look for opportunities to win the ball back. This process of proactive, attacking defence starts with trust and communication. When faced with contact, the earlier someone declares responsibility for the tackle, the earlier supporting defenders can ask and answer other questions. Does the tackler need help? Is there an offload threat? Should I contest for the ball or are there more attackers there who’ll likely secure it easily? 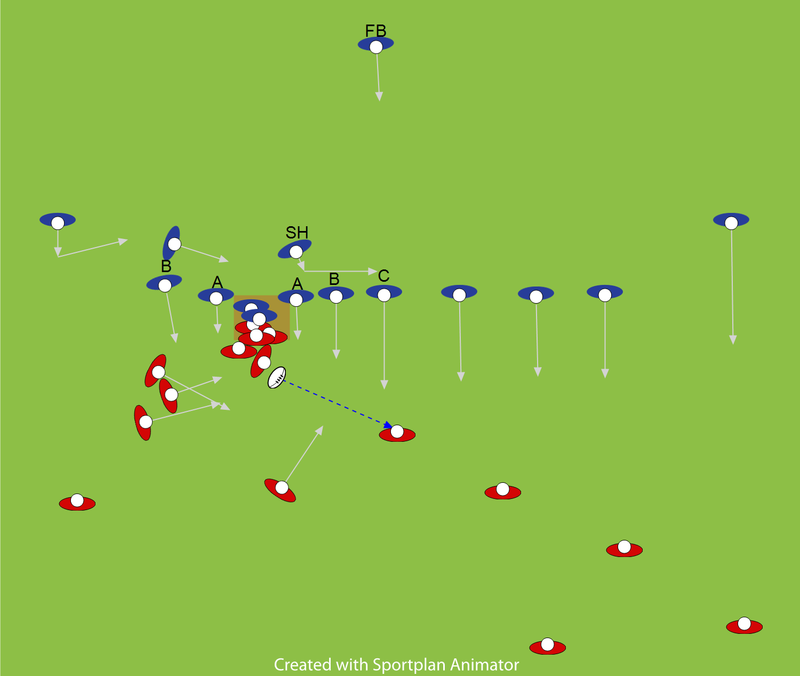 Aided by the scrum half (who should float behind the contact area like free safety in football), making and communicating decisions at the contact area allows the rest of the defensive line to adjust and assess the situation in front of them all the way across the field. Without effective communication, defenders tend to gravitate toward the ball or at least focus too much on it and not what’s unfolding in front of them. From a position of trust, in addition to communication and patience, defenders can maintain a solid line and not waste energy in battles already lost. In much the same way we look for weaknesses in defenders to enhance our attack, we can look for opportunities while playing defence that can allow us to get the ball back sooner than later. As described above, if we don’t over-commit to rucks, we should have at least one extra body in the defensive line to double-team a ball carrier. A popular tactic at the moment is the ‘choke tackle’ – whereby two or more defenders hold up a ball carrier, inviting a maul to form. They get a bit higher than a strong driving position, instead swarming around the ball so it cannot emerge. When the maul’s forward progression stops or if the maul collapses naturally (i.e. not pulled down, but falling due to momentum), defending players are not obliged to let go and the referee awards them a scrum. Several teams have also seemingly given up on putting in big hits in favour of taking ball carriers low around the legs – which some refer to as a ‘chop tackle’. (I imagine coaches much older than me would simply call it a ‘proper’ tackle, and I wouldn’t disagree!) I have written before about why I don’t like dump tackles that much, but proof can be seen in this clip where low tackles make it more likely that arriving defenders can contest the ball before the ball carrier’s support arrives. Finally, a steal is made because the tackler has time (and he certainly wastes none!) to get back to his feet and get his hands on the ball. Defending requires controlled aggression, trust, and communication, but if we only have a reactive attitude, we are only hoping the attacking team makes a mistake. Proactive defending – going after the ball at every calculated opportunity – requires players to read signs and/or body language that provide the best opportunity to strike. Effectively employing the extra tackler requires that person to assess the threat in front of them. If he decides to push out to make a double tackle and ignores the threat of an inside offload then he might have just given away a try. But if the ball carrier has the proverbial ‘blinkers’ on – looking straight ahead, ignoring his support – and has the ball tucked under one arm, he’s open to a hit from the side. This is especially useful on big, powerful runners who are difficult to stop head on. Though no small man himself, Quins’ Joe Marler steps in from the side and lays a big hit on George North because he’s assessed that North is aiming to run over his team mate and certainly not pass. Attacking players change angles to draw defenders out of line. By reading this ploy early and trusting team mates’ ability to hold the integrity of the line, defenders invite ball carriers to run themselves into trouble. In this clip, Quins’ Maurie Fa’asavalu reads the switch and proactively smashes Andrea Masi from a strong position, dislodging the ball and even getting a steal in the process! Sometimes assessing the situation requires the tackler to take a risk. In the following clip, the defender looks to be outnumbered but brilliantly reads the play to put in a devastating blind-side hit. His side manages to win the penalty after a team mate of the ball carrier plays the dislodged ball from an offside position. What Tom Fowlie recognises is that the passer has thrown the receiver a bit of a ‘hospital pass’ – a floated pass where a defender is in a perfect position to step in and make a tackle. (These are things attackers must recognise, and in Wallace’s case, he should have held the ball or maybe attempted a long pass behind Fowlie, who is most definitely lurking with intent to smash Hopper.) Fowlie trusts that his team mates will cover the break out side and he’s made a calculated gamble on stepping up to either make the big hit or force the passer to hold the ball. If he played this more conservatively, Quins would have surely broke out beyond half, if not scored. In less-risky situations, defenders can step out of line to make big and/or smothering hits or at the very least force the ball carrier into a less-than-ideal decision. In this clip, Northampton has plenty of defenders in the middle of the pitch – where Saracens obviously want to play. On the replay, you can see that Samu Manoa has this tackle lined up from well back, looking both inward and forward to time it perfectly. Sprinting into a tackle as such has some risk when done alone, because the ball carrier could step suddenly or the passer could miss the intended target. Manoa makes his move with team mates close-by who are in a perfect position to counter ruck. (Fair play to Saracens who manage to secure possession!) Another visual cue that can provide an opportunity to win the ball is the quality and/or timing of the pass delivered to the player being marked. Good passes are put in front of the ball carrier’s hands, giving them time and space to make a decision and act on it. Poor passes, thrown too high, too low or even directly at the receiver cause him to adjust his run, if not stop dead in his tracks. In this clip, the pass isn’t that bad – but as the receiver is taking it flat it’s height means he has to check his run ever so slightly. He’s also unfortunately picked a line that has him running directly at a defender, not a gap. Koree Britton is a bit slow to re-align – he should hustle back quickly to have time to assess the situation – but reads the pass and Festuccia’s line just in time, however, to step in and make a solid low tackle. This is a great example of a dump tackle isolating the ball carrier and getting defenders on the front foot so they can contest the ruck. Here’s another incident where a poor pass allows the tackler to step in and make a huge hit that dislodges the ball. Finally, here’s a clip where the passer does a poor job of reading the situation, with the defender doing a much better job of it. The pass isn’t a bad one if the defence was drifting together, but Benson Stanley is already anticipating it and sprints forward early to chop the receiver down and allow his support to win a turnover in the ruck. Defenders shooting out of line run the risk of opening a gap behind them, but Stanley’s timing is perfect, staying level with the passer until the ball is just out of his hands. If you want the condensed version on how to play effective defence, remember that the same principles which determine successful attack apply when trying to stop it. Go forward to take away time and space, maintain continuity to ensure gaps – especially interior ones – are plugged, and maintain both physical and vocal support structures to account for rugby’s non-stop, dynamic nature. Build the defensive line close to the tackle contest first. Urge players to work together and communicate in small units. Make sure you have layered defence to account for line breaks and kicks and make sure those players provide direction in close and out wide. High work rate off the ball is vital! The team that is organised first has the advantage when scanning and accounting for threats / opportunities. Nothing is more frustrating for a fly half than facing more defenders set, aligned, and focused than he or she has in support. While I believe that international and pro level attack structures and tactics shouldn’t necessarily be adopted by amateur, and especially school sides, I feel we can take a lesson from how they play defence. We must strive to win the ball back as soon as possible, but in order to avoid penalties we need to be patient about doing so from a position of dominance and within the laws. Most top teams commit just one or two players to most tackle contests, making an attempt to steal first and then being a nuisance to prevent quick ball. 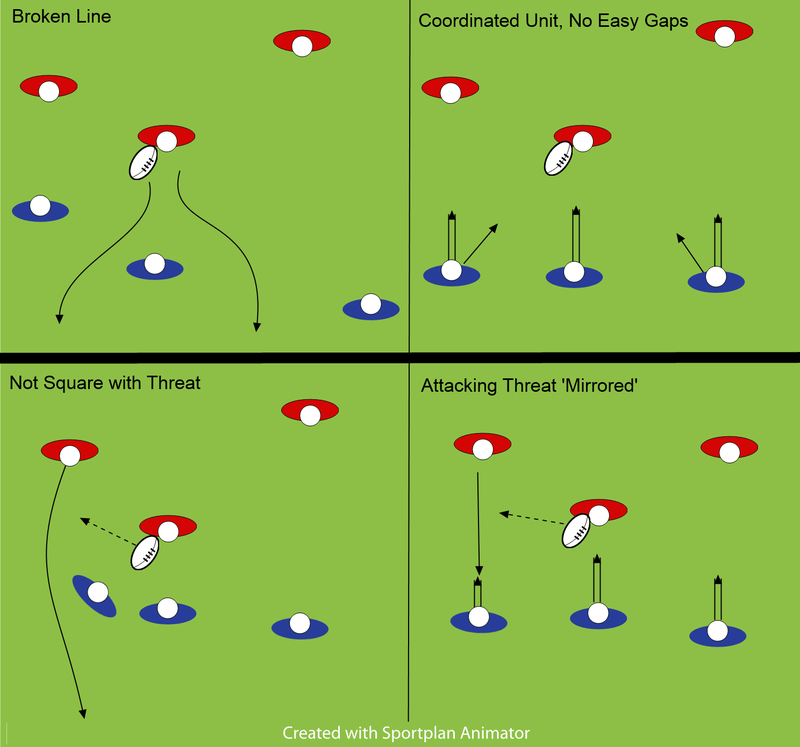 The rest take up positions in the defensive line, often creating the situation described earlier where more defenders are standing than attackers (who’ve likely sent three or four in to secure the ball). This situation should then allow the defensive team the opportunity make an effort to re-gain possession on the next phase. 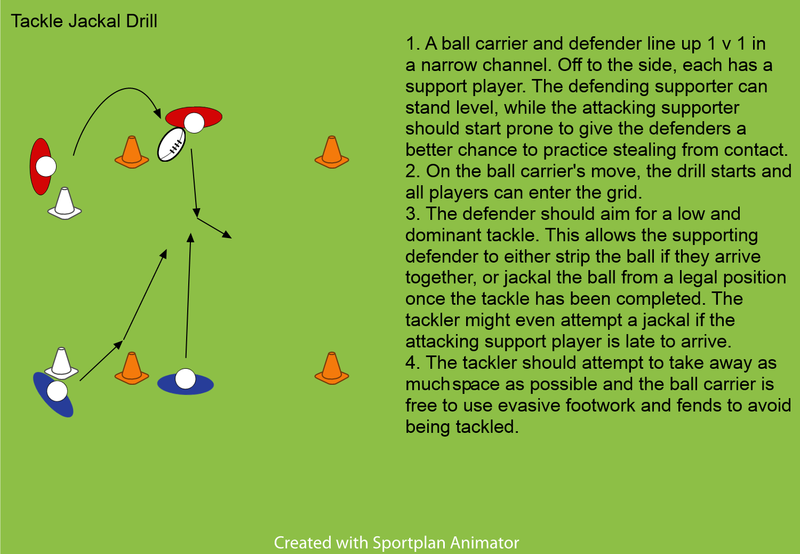 Some of these are: tackling a ball carrier into touch, forcing a mistake, making a double hit and rip, stealing or ‘jackaling’ the ball on the ground or driving over with a well-timed and coordinated counter-ruck. 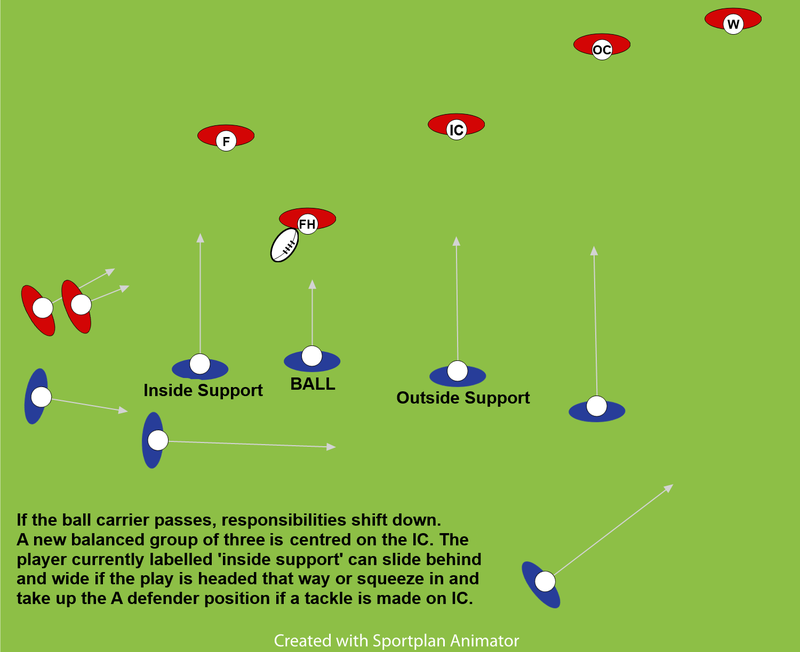 A well-organised and coordinated defence can also win the ball back by passive means, offering no opportunities to the attacking team such that they elect to kick. 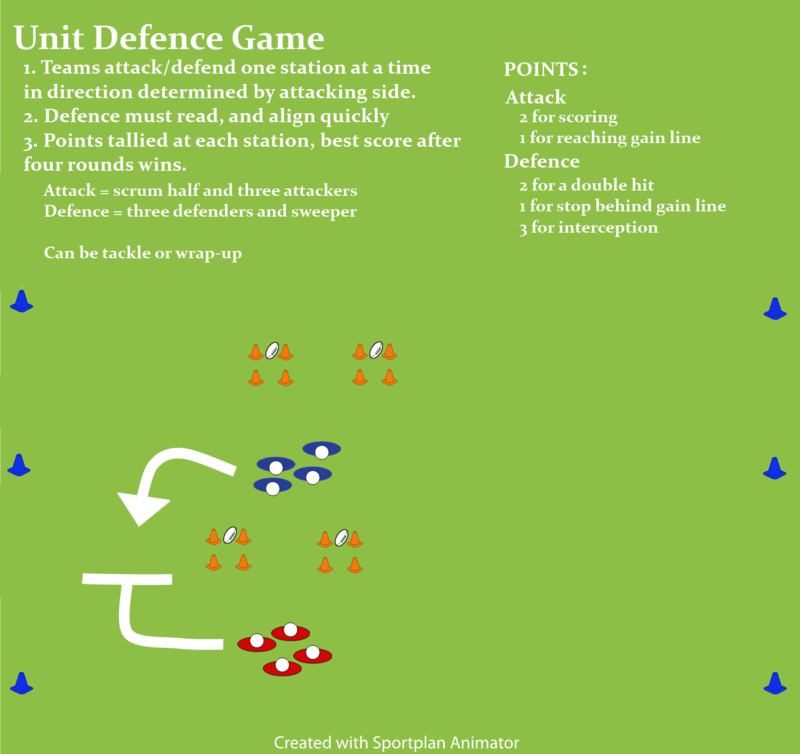 Developing your team’s ability to counter-attack effectively, needless to say, must be part of a sound defensive strategy. While I like to mix up the way I train teams in attack, I tend to stick to the above drills and games for defence as I feel more is gained from repetition and familiarity when developing structure and communication. Whatever your numbers, I feel it’s important to have live opposition, reminding players to keep it realistic if there are, say, four attackers against ten defenders in a team defence game. Small sided games can be just as effective, remembering that work around the tackle contest usually involves just a handful of players. Finally, I try and give a lot of feedback in drills, but not a lot in small-sided or team games, urging players to remember the lessons learned in drills and work together to solve problems positively, only stepping in to facilitate understanding if they’re struggling to come to a solution.